Another Deep Purple connection severed with the news of Chas Hodges’ death. It has been interesting to read the details of his long career, and let’s face it it’s hard not to have enjoyed some of his hits with Chas and Dave which always bring a smile when they’re on the radio, and made him a household name. In the early days of delving into Deep Purple’s history, discovering The Outlaws and tracking down their singles was mandatory, mainly to hear what the fledgling guitar work of Ritchie Blackmore was like rather than Chas’s bass playing I must confess (though he was apparently one of the first in the UK to own an electric bass). It was always a red letter day when we found a new picture of the four piece for the collection (that’s Chas on the right in this vintage shot, and Gillan drummer to be Mick Underwood in front of course). The famous clip of him and the band in Live It Up is worth a look if you’ve not seen it, Chas on a twelve string. Chas would later join a more progressive rock / country outfit in 1970 called Heads Hands & Feet, who actually supported Deep Purple at some shows in the UK in early 1971. Roger wasn’t well one night, and Chas deputised as the show had already begun. He also turned up on that great all-star rock blues jam session Green Bullfrog the same year to cement his place in the Purple family tree. The Guardian have done a good obituary and I can do worse than link to that. Although Blackmore has made it to Russia a few times with Blackmore’s Night, they’ve never had him in rock mode, so the announcement of two Rainbow shows over there in April 2018 should go down well. Thanks to Mark Maddock and Mike Richards for the info. Rainbow have had to pull the Manchester concert. Last week the Arena was saying shows would restart (and we reported this below) but clearly work is taking longer than hoped, and they will not now be able to reopen until September. It’s probably too late to find an alternate venue. Ticket holders are being refunded and we know some people who have had their refund already. UPDATE – forgot to say, the refund also offers a discount on tickets for other shows to make up. I don’t think we needed a tarot woman to predict that the audio of Rainbow‘s 2016 NEC show (or whatever they’re called the arena this week!) would appear as a stand alone 2CD release after a suitable window for the set which first turned up as a bonus on the Japanese edition of the 2016 tour set last year. Live In Birmingham 2016 also includes two songs not performed at the German shows, Burn and Soldier Of Fortune. According to people who did all three gigs (and Ritchie!) the NEC was the best of the lot. This is by way of the build up to this years concerts and is out the second week of June. I’m not sure if this is the finished cover, but it is the image sent out with the press release. The Man In Black’s due back? Lots of chatter suggesting that Blackmore will confirm five more Rainbow shows in Europe during 2017, as was mooted back when the first shows were taking place. His new singer Ronnie Mk 2 has also been talking about looking forward to this. Let’s hope they can spend a little more time rehearsing to allow them to develop the potential shown in some of the set. Blackmore has apparently taken on board, probably not without a little satisfaction, people’s preference for the next set to be more focused on Rainbow’s own catalogue. Meantime there are rumours that once Coverdale and Paice showed him the door, Blackmore tried to get Hughes on board with similar results. Looks like he needn’t have bothered! Still no news at our end on the projected DVD/CD of the 2016 show, has anyone else spotted a release sheet? In fact, this is a selection of bootleg CDs from the three shows churned out in just a month by labels in Japan (hence my sad stereotyped opening few words.) They all seem to be different too. Astonishing. Not seen anything quite this frantic since the early Purple reunion era, and even then it took them several months to get up to this sort of level. I think I like the one best second up on the right which uses the lighting to good effect, and also because that’s about the view we got! Maybe best just to wait for the official one after all? … the brain cells must still be functioning a bit then, here’s the same jacket Ritchie was wearing at the Loreley show the other week. ….as someone said on the radio this morning. Well yes, but we’re all still downright miserable at DTB HQ, so here’s a photo of a rainbow to cheer us up. A little less costly to set up and run than the one in 76 perhaps but quite effective. Don’t forget to send us your thoughts after the show on the special review page. Taken by Tonny Steenhagen. Being interested in architectural history and such I was interested to hear that English Heritage (or whatever they’ve been renamed this week) are involved in a work which looks at the architecture of Liverpool’s music venues. I was even more surprised when one of the researchers got in touch about my infamous 1977 shots of Blackmore up in one of the Royal Empire Theatre’s boxes, trashing his Strat against the ornate plasterwork, saying they would love to feature this in the book. The thought of seeing Blackmore in a University text book really amused me, so I rescanned the prints (you can even see the fixer stains from the darkroom in the top right!) and sent them over. Rather than ask for a fee, I settled on a review copy of the book, so will let you know what it’s like. I only had time to fire off a couple of frames (these days you’d stick the burst mode on and run until the battery went flat!) and there is shot on the DPAS archive site, but not sure I’ve posted this one before. As a result of this stunt, Blackmore was banned from the venue and all others owned by the chain, a ban I’m not sure has ever been lifted. Anyway, no such worries if he wants to get a bit carried away at the NEC, I think quite a few of us would give him a hand. So, was this just a Happy Shopper version of Rainbow, or something more substantial? Well there’s only one man who knows the answer, and he was keeping very quiet on Saturday night, saying just two words* to the 10,000+ sold out NEC crowd, and that was merely to announce the name of his singer. Which was fitting really, as without him this version of Rainbow would certainly have been an awful lot less entertaining. And from what I could see the audience took to him fairly quickly and were really up for it from the reworked version of Highway Star onwards; how much of this fervour was a determination to enjoy it or simply relief to have the man back playing rock again is hard to say, but there was something very comforting being in a crowd who knew all the words to all the songs (Spotlight Kid aside possibly!). You forget how much shared experience there is in following a guy like this, and it’s nice to be reminded of it sometimes. I deliberately steered clear of online video and audio clips so not to pre-judge the show (or lower my expectations any further! ), and from what people were saying, the vibe was far from positive so I’m glad I did. An inside gig is a very different beast to outdoor festival slots, and I’m glad we opted for this – and that Rainbow decided to do it instead of a UK festival (look what was happening down the road at Glastonbury). We had quite a relaxing drive down, neither of us wanted to discuss the show much I guess. We took the A roads as the rain was so heavy up our end, gave our lunch money to the nice people at Cromford Mill’s café and were getting lost in the poorly signed NEC road maze before we knew it. A couple of hours passed quietly at the hotel where our friend Dave Browne was booked in so he could nervously watch his home team in the Euros (sorry David) and this kept us occupied until it was time to saunter over to the Arena, having a quick word on the way with Jerry Bloom who was worryingly walking away from the venue, perhaps having been turned back for wearing a Tommy Bolin t-shirt (! ), before meeting up with more old-timers in the foyer to natter until show time. As the reality broke through, it was time to try and take stock. Certainly this was a Ritchie Blackmore in his seventies rather than in The Seventies. There is no getting away from the fact that some of the fluidity and speed isn’t there, and the occasional mis-fire could be heard, but he was still very much recognisable as our Ritchie Blackmore, one out on his own. He didn’t disgrace his legacy and worked with the restrictions time and age have imposed upon him rather than attempting anything too tricksy. And it was just so good to see and hear him with a Strat again. If I did wonder during the odd moment why he’s been noodling away on a flipping hurdy gurdy for twenty years, then he must have his reasons. Whatever they were it was good to have the rock Ritchie Blackmore back, if only for a couple of hours. There too is little hiding the fact that this was primarily a pension fund operation. By excluding any big names, the outlay could be minimised and the revenue maximised. With tickets and merchandise, he should have done well out of it and good luck to him on that level. It is a perfectly valid exercise; he has something a lot of fans wanted to see again and as it sold out in minutes then clearly there were more than enough of us ready to shell out our £55 squids plus expenses (£16.75 for a beefburger at the hotel if you were wondering. An extra quid if we’d wanted it in a bun!). But in turning up with scratch band and putting it on at the NEC you are in effect saying ‘this is a big deal’, and as such the audience deserved to be treated with some respect. And whatever the long and protracted backstory to these shows, I didn’t feel patronised from the stage at any point. Given the apparent eventual lack of ambition for the return of Rainbow, I’d fought against getting caught up in it all right until two weeks ago, but I suppose curiosity got the better of me. That and perhaps the idea that by going I could close the circle on following Rainbow – sometimes avidly (I did around half the UK shows on the first couple of tours) – across 40 often turbulent years. I did try one Blackmore’s Night show a decade or so ago to see if I was missing something, but if anything it was even worse than the records, so I hadn’t ever planned or expected to see Blackmore live on stage again, content to live with the memories of those often glorious early concerts. But then I had also vowed never to bother paying to attend a stadium rock show again, so come Saturday evening I was already eating my words before we even got inside! I’ll leave set lists to others, it certainly didn’t deviate much from those in Germany, but Rainbow did more than enough to please just about everyone. Sure the band are not top flight, and are hardly a proper band, but the singer coped with most of the material, arguably best on the Ronnie Dio era tracks. He isn’t Ronnie, nobody could be, but there was a lot of power there and he didn’t hold back. His was always going to be an interpretation, Ronnie helped bring those tracks to life so they were personal, but this new guy delivered and I doubt he had any voice left to order breakfast on Sunday morning. The vocals were also high in the mix to cut through a sometimes turgid NEC and stage sound, and were balanced against the guitar, which also got pushed up so we could all hear of what was going on. 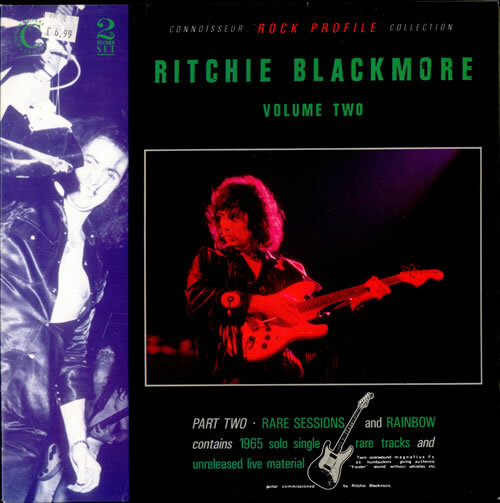 Blackmore then certainly wasn’t hiding or holding back, and while the playing wasn’t as spine tingling as it could be twenty years ago, it was mostly interesting and enjoyable. Overall his performance was very much a greatest hits sort of approach, little of the voyages off piste we used to enjoy so much perhaps, but more laying down a marker as if to decide whether this was something worth taking further in future or not. He has said he wouldn’t want to do an album, but then he he has changed his mind in the past, and to give this much longevity it would need more commitment. I’m sure there are other markets to take the Rainbow experience to should he feel the need, enough to keep this version of the band rolling as a comfortable retirement project for a few years at least, if his arthritis doesn’t prevent it. Rarely has the line “I feel I’m getting older…” seemed more poignant than it did here, Ritchie doing the track perched on a barstool with an acoustic. And then, two thirds of the way through a show I’d been enjoying for what it was, out of nowhere came a sledgehammer version of Stargazer which showed what could be achieved. It slammed into the crowd with an intensity and drive which I really hadn’t seen coming and was as blissful a few minutes at a rock show as I’ve had for ages. It reminded me of full-on Killing Joke or Ministry at their peak, and all at once you think, if they wanted to come back another time and do the full Rising album for us like this then you might just tap us for another couple of tickets. For me this alone was worth the price of admission and made me glad I’d bothered. If not, and he decides this is it, then it closed the Rainbow story for me on a good note. A few questions remain. Will I bother to buy the inevitable CD / DVD (I didn’t see any cameras at the NEC show but the German gigs were apparently filmed as well as taped – though I doubt they were better)? Probably not. Like that dull Gillan’s Inn CD from a few years back, why would I not want to put on the best versions to listen to? Would I go again if they do more greatest hits shows next year (as has been mooted)? I honestly doubt that with this band and the level of ability on show they would get much better, so I’ll be happy to leave it there. Will the person operating the electric rainbow be able to get it right? It was funny to see even 40 years on that technology can still go wrong, with the timing and sequencing leaving gaps in the effects (which were pretty good) from time to time. Unless it was a subtle tribute to all those thousands of 1970s lightbulbs! We would like to thank Rob and Martin for giving us first refusal on spare tickets. It was also great to meet up with them and a number of the old crew. Mike, Dave, Andy, Russ and others helped relieve the inevitable pre-concert tension many of us felt as we tried try to work out just why we were there! 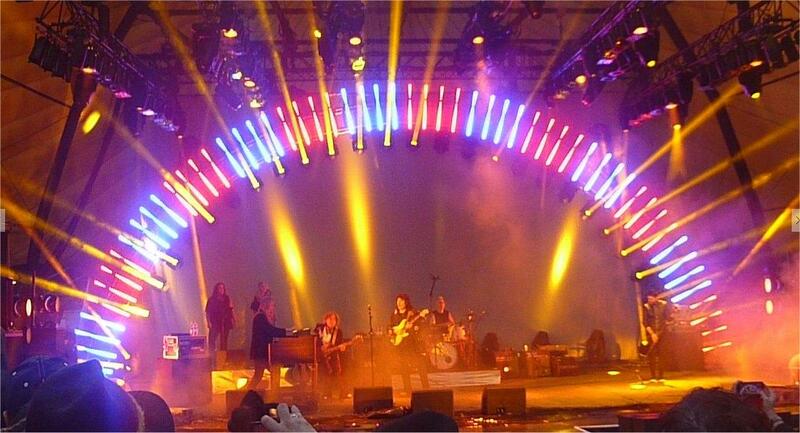 I have added a separate page for all the reviews and everything Rainbow show related. This has early comments on the first show, etc. There is a set spoiler too BUT I have buried this at the end of the page, so you will not stumble on it by accident!